This arrived weeks ago, but I kept forgetting to take a picture. I got my preview copy of the paperback from Amazon. An actual, physical copy, that I can hold in my hands! Even if nothing else works out, this is more than I ever expected when I set out to become a writer. There’s just something wonderful about holding your own creation between your fingers, knowing that an idea has become a reality. It’s heady, intoxicating, and I’m already looking forward to seeing the next one. James lives on a small farm in Eastern Washington with his wife, children, and far too many chickens to count. 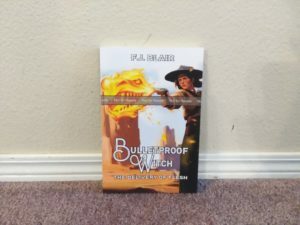 Bulletproof Witch is his first published work.